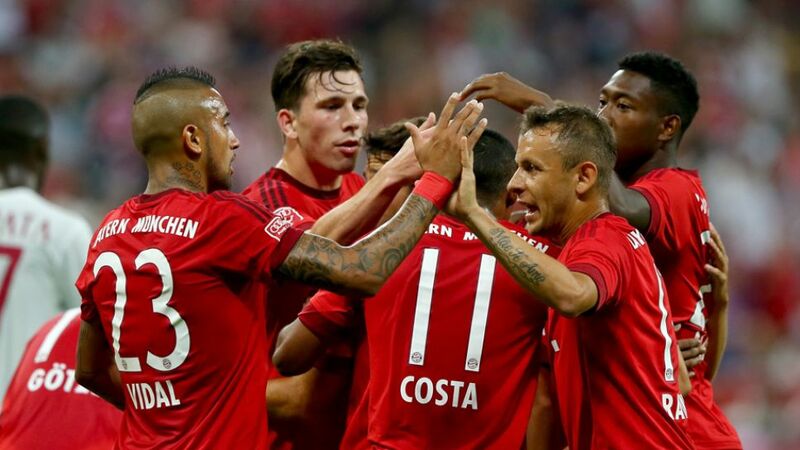 Goals from Juan Bernat, Mario Götze and Robert Lewandowski won the game for Pep Guardiola’s men as they delivered a free-flowing display of football and should have won by a far greater margin. Bayern boss Pep Guardiola sprung a surprise or two in his starting line-up, with Sven Ulreich starting in goal and Joshua Kimmich in midfield. The latter had to be withdrawn after just 20 minutes, but that didn’t stop the home side, and new signing Douglas Costa in particular, from completely dominating the visitors from in the first half. The Brazilian had already fired two fizzing centres across the box before Juan Bernat’s deflected drive brought the opener, with Pierre-Emile Höjbjerg later touching a Costa cross onto the post. Costa fired straight at the goalkeeper and then shot over at the second attempt, before Arturo Vidal headed against the bar and saw a goal-bound free-kick headed over. To Milan’s immense relief, Vidal and the effervescent Costa were withdrawn at the break, and Sinisa Mihajlovic’s side managed to threaten an equaliser when Carlos Bacca shot wide. Bayern remained on top, however, with Götze having a shot blocked and Lewandowski twice going close from inside the six-yard box. The introduction of Thomas Müller allowed Pep Guardiola’s men to regain what control they had lost in the game, and with 17 minutes to play, the result was effectively sealed when Götze swept in after Lewandowski’s shot had been blocked. The Pole then added a final gloss to the scoreline with an emphatic volleyed finish to set up a clash with the Madridistas on Wednesday evening.